The Curious Wavefunction: Book Review: Elizabeth Kolbert's "The Sixth Extinction"
Book Review: Elizabeth Kolbert's "The Sixth Extinction"
Elizabeth Kolbert combines the sharp observational powers of a field biologist with the literary skill of a seasoned and thoughtful writer. In her previous book “Notes from a Field Catastrophe”, she travelled to far-flung parts of the globe to dig up stories on the deleterious effects of climate change. 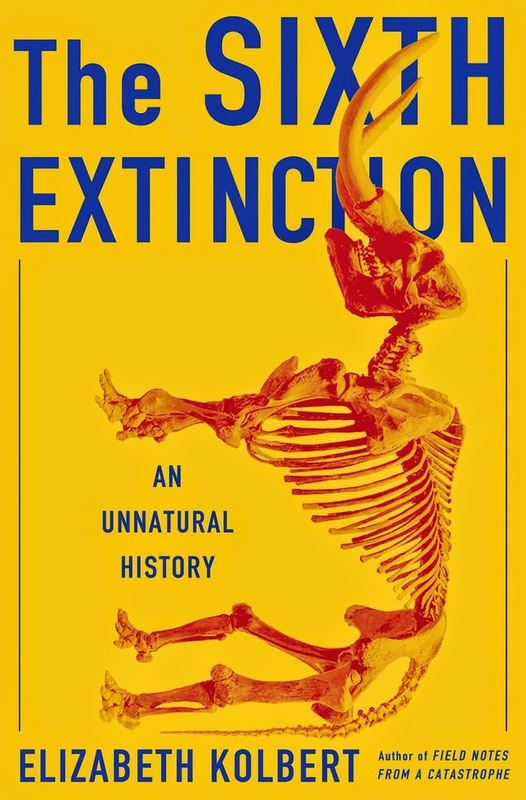 In her latest book she combines similar reporting from around the world with chapters from the history of science to bring us a noteworthy account of one of the most spectacular and important stories of biology and history – mass extinctions. There have been five documented big extinctions in history, with the most popular one being the death of the dinosaurs that was memorably caused by a meteorite. However we are probably now in the throes of a sixth extinction, and as Kolbert documents, at least parts of it are being caused by human beings’ destructive tendencies and our unquenchable thirst for natural resources. The concern for extinctions is not merely a discussion for the drawing rooms of bleeding-heart environmentalists; as a chemist, I am well-aware that about half of all drugs on the market are derived from natural sources. Every time we kill off another marine sponge or frog, we may be depriving ourselves of the next breakthrough drug against cancer or AIDS. Kolbert starts by telling us how we came to know about extinctions in the eighteenth century. It took a long time for scientists and the public to actually believe in such devastating events, simply because of their magnitude. It was Georges Cuvier, a French naturalist, who painstakingly collected fossils and bones of giant and exotic creatures from around the world and turned conjecture into reality. By cataloging their sheer abundance Cuvier convinced everyone of the reality of worlds lost in time that were completely different from our own. Charles Darwin and Charles Lyell who came after Cuvier also debated extinctions; but since Darwin’s theory required very gradual changes over time, he could not quite fathom how entire species of animals could disappear in an evolutionary eyeblink. Kolbert also tells the fascinating story of the Alvarez father-son duo who discovered the potential reason for the extinction of the dinosaurs by measuring the startlingly high concentration of iridium – an element found in abundance only in meteorites – in certain clay layers. The real meat of the book is Kolbert’s travels to different parts of the world and her reporting of what seem like extinctions of specific species. In one chapter she explores the impact of climate change on ocean acidification – one of the more neglected aspects of the global warming debate – on coral reefs. Ocean acidification is a consequence of simple chemistry; when carbon dioxide dissolves in water it lowers its pH, and the resulting acidic solution starts to eat away at corals which are composed of calcium carbonate. Last year I was in Hawaii and one of the most revealing experiences I had there was snorkeling around the island where Captain James Cook was killed. Peering through the goggles, I could see not only a spectacular ecosystem of fishes, tube worms, sea cucumbers, jellyfish and other denizens of the deep but also how critically dependent all of them were on the coral reefs. The worms were permanently latched on to the reefs and the fishes were constantly kissing the surface with puckered lips, consuming the plant and microbial material deposited in the oxygen-rich pores of the intricate structures. Clearly the reefs support many living worlds, and as Kolbert finds out first-hand, these worlds are being depleted by ocean acidification. Even those who may be skeptical of the warming effects of CO2 emissions should take this impact very seriously. And as I mentioned before, nor is this concern purely moral; marine sponges have been the source of some of the most promising drugs against cancer and will continue to be so. Kolbert also explores the disappearance of other species spanning the spectrum of species diversity, from birds to frogs to mammals. In documenting this she travels to caves in Italy, rain forests in Central Africa and even a location in – of all places – suburban New Jersey, where traces of the K/T boundary event that killed off the dinosaurs can be found. Fungal infections seem to be a leading and particularly concerning cause of several current extinctions, most notably those of New England bats and Panamian golden frogs. Amphibians are more affected than almost any other species partly because of their sensitive skin. In a vivid chapter Kolbert locates an artificial ecosystem set up by scientists in Panama where the last few hundred golden frogs survive. By now the fungus is so rampant in their natural environment that releasing them outside would be fatal. These brightly colored creatures, nurtured by their human caretakers, are the last surviving members of their tribe and on the brink of disappearing from the face of the planet. A similar poignant chapter introduced us to a male Hawaiian crow, who just like the golden frogs, is part of a species that exists only in a zoo. All attempts by the zoo personnel to induce this crow to mate have been unsuccessful so far and one does not know how much longer his thread will stay unbroken. Kolbert wisely stays away from attributing many of these species disappearances to human activity. But in many cases there is strong evidence that does link human activity to rapid species depletion. In this context deforestation may be an even bigger threat than climate change; indeed, a universal mathematical scaling law linking number of species to area seems to encapsulate the impact of deforestation. So is the introduction of non-endemic species by air and sea travel which when introduced into a new ecosystem find themselves free of predators and start decimating the local population; the brown tree snake which was introduced in Guam and which literally ate its way through several bird and amphibian populations is a noteworthy case. The voracious zebra mussel which has wreaked havoc in waterways in the US is another example. The impact of humans is undeniable, and in measuring this impact we see the sometimes cruel and indifferent streaks of inhumanity which mark us as one of the few species on the planet which takes pleasure in killing others. Particularly barbaric was the butchering of the flightless Great Auk to extinction in Northern Europe in the nineteenth century; Kolbert talks about how hungry sailors devoured the auks not only by dunking them in boiling water but also by using them as fuel for the fire underneath. One of the simple reasons why humans can quickly render larger animals extinct is because of their slow breeding rate. This explains the disappearance of the megafauna in New Zealand for instance, where the hunting of the large, flightless moa provides a stark test case. In ecosystems untouched by humans, whatever disadvantages are suffered by creatures because of their slow reproductive rate can be compensated for by their larger size and strength. When intelligent human beings wielding weapons arrive on the scene, the equation radically changes. This is precisely why larger animals like lions, tigers and apes are the most threatened species today. Perhaps the most fascinating aspect of humans’ devastating impact on other species emerges when we look not to distant species but to a very close one – the Neanderthal. One of the most significant discoveries in science during the last few years has been the realization that after encountering Neanderthals in Europe and Western Asia about forty thousand years ago, Homo sapiens first interbred with them and then somehow killed them off. There is something deeply creepy about this fact. As revealed by groundbreaking recent work on sequencing Neanderthal DNA, virtually all of us have between 1 and 4 percent of this DNA in our own genome. We may even have inherited a few genes for disease from our close cousins. This work has been made possible largely by the efforts of Swedish geneticist Svante Paabo who Kolbert interviews, and his recent book provides a fascinating look at the sequencing of the Neanderthal genome. What caused Neanderthals to go extinct while we lived? War certainly could be one reason; after all population sizes as well as mortality rates then were quite low. Perhaps Neanderthal populations were already on the brink of extinction when humans met them so purely on a statistical basis they may have been unlikely to survive for too long. My favorite explanation is disease. It is very much possible that interbreeding between modern humans and Neanderthals made the latter more susceptible to certain diseases passed on from humans. Neanderthals could also have been more prone to certain diseases to begin with. There is also some evidence that humans were more creative and intelligent than Neanderthals, so we may have been better equipped to deal with diseases than our “less evolved” cousins. Whatever the reason, the co-existence of humans and Neanderthals followed by their disappearance is another data point on the table of extinctions in which humans might have played a dominant role. The whole saga of extinctions also conceals a profound irony. In death there is life. The same great five extinctions that killed off more than 90% of species on the planet also opened up ecological niches and resources to previously suppressed creatures. Dinosaurs made room for mammals and amphibians and led to the evolution of human beings. It is also almost poetically ironic that a few members of the same human species that killed off so many of its evolutionarily distant and close cousins are also making heroic efforts to preserve the remaining members of certain species in zoos and other ecological enclaves. We don’t know how this story of extinctions is going to end. Perhaps it will end with humans killing most other species on the planet by breaking the chain of interdependencies between various animals and plants. If we do this we may be killing ourselves by destroying the intricate web of natural resources that allows us to farm, feed and clothe the world. Or perhaps we may kill ourselves more directly through climate change, overpopulation or nuclear war. In any case, the history of extinctions tells us that the planet will survive. Nature always finds a way. Nature always finds a way because Nature doesn't play favorites.